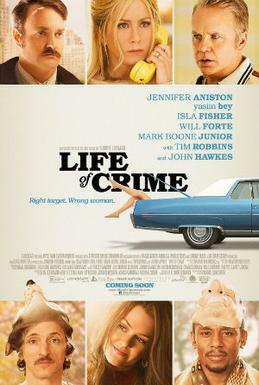 ‘Life of Crime’ is a Fargo-esque tale of a kidnapping gone wrong that retains the easy going comedic touch of the Elmore Leonard novel it’s based on. It follows three kidnappers (John Hawkes, Mos Def and Mark Boone Junior) who plan to kidnap a socialite, Mickey (Jennifer Aniston) and extort money from her husband Frank (Tim Robbins), but the gimmick in this case is that Frank is having an affair with Melanie (Isla Fisher) and isn’t particularly interested in getting his kidnapped wife back. The kidnappers then have to find a way to turn the tables before things are allowed to get too serious. It’s not the strongest Leonard adaptation, but a solid cast and some well placed humour keep this watchable throughout. Aniston and Hawkes are particularly good, although both struggle to sell the Stockholm Syndrome aspects of the story, which don’t land as well as I’m sure the director hoped. An enjoyable watch, but very much by the numbers, and it’s not as sharp as some of the films it clearly takes inspiration from.